By clicking on the portal below, you can download a PDF of the December 26 Edition of the San Bernardino County Sentinel. (December 22) San Bernardino County Sheriff John McMahon was the highest-paid county elected official in California in 2013, according to state controller John Chiang. During his first full year in office as sheriff, McMahon received a total compensation package of well over half of a million dollars. According to Chiang, McMahon received $363,986 in total wages in 2013, which included $225,499 in regular pay, a $121,579 lump-sum for cashed-out leave time following his appointment in December 2012, and another $16,908, described as “other pay,” which covered his car allowance and cell phone usage. In addition to his salary, McMahon was provided with another $170,780 in retirement and health benefits, which included a $114,812 defined benefit plan, a $11,215 retirement contribution, $31,804 in deferred compensation and $12,949 provided for health/dental/vision coverage. McMahon’s total compensation surpassed that of then-Los Angeles County Sheriff Lee Baca, the state’s second-highest paid elected county official in 2013, with $347,786 in total wages and more than $140,000 in benefits that pushed his total compensation package to roughly $490,000. The controlling factor that rocketed McMahon to the top of the field among the state’s elected county officials was the $121,579 lump sum for cashed-out leave time he received. The lump sum was for vacation, holiday and sick time he had accumulated before he assumed the sheriff’s position. As an elected official, a sheriff is not permitted to maintain leave balances. McMahon fared particularly well in 2013 in that San Bernardino County ranks as 23rd out of the state’s 58 counties in terms of pay and benefits provided to employees. San Bernardino County, which employs 21,985, paid them an average of $48,997 in total wages in 2013 and provided them with another $20,321 in retirement and health benefits on average. The state average on per employee pay was $58,521 and $22,546 in benefits. District Attorney Mike Ramos was the fifth highest-paid district attorney in the state, bringing down $259,451 in total wages, which does not include benefits. That was par for the course, as San Bernardino County is the fifth largest county in the state. Four of San Bernardino County’s supervisors, none of whom was identified by name, received salaries that ranged from $168,000 to $173,000, which was more than all other supervisors in California except their counterparts in Los Angeles. A fifth San Bernardino County supervisor earned about $163,000. McMahon was appointed to the sheriff’s position in late 2012 and, running as an unelected incumbent for sheriff this year, was elected to a four-year term in his own right. While the inflated salary and benefits he received in 2013 was shocking to some, there were many other public employees in California who were paid more. McMahon was the highest paid elected county official, but nine unelected county officials throughout the state earned more. And some state of California employees were extremely well paid. $587,675; a senior psychiatrist supervisor with the state earned $580,776; a staff psychiatrist with the state earned $546,116; and another senior investment officer with the California Public Employees’ Retirement System earned $541,540. Chiang released the update to his database on December 15, 2014, adding the 2013 data. He said it was his intent to provide “the public with a broader picture of public compensation. California must not only restore public confidence that their governments are responsive and accountable, but provide the necessary information and tools to empower citizen participation in civic decision-making,” Chiang said. SAN BERNARDINO—(December 24) Depending on your perspective, the city of San Bernardino’s first place position in a nationwide internet voting contest that has a stretch of E Street being recognized as typifying the “best urban street transformation” nationwide in 2014 is either a vindication of the sbX project or a further indication of how desperate its supporters are to justify an indefensible squandering of taxpayer money. The sbX bus line was the offspring of the San Bernardino County Transportation Agency, the cities of Loma Linda and San Bernardino, and Omnitrans, all of which cooperated to create an interurrban high speed transportation service. The $192 million project was originally intended to run 15.7 miles from near the Veterans Administration Hospital in Loma Linda to just north of Cal State San Bernardino, the sbX line features 60-foot long articulated buses that use clean-burning compressed natural gas as fuel. Each bus on the route was to touch down at just five stops between its starting points/end destinations and complete its run in just under 25 minutes, rivaling or actually bettering what a commuter utilizing a car typically encounters over the same span utilizing the freeway during the morning or evening rush hour. Like the unconventional capitalization and spelling used in its acronym – sbX stands for San Bernardino Express – the route embodies unusual features such as a dedicated lane for more than a third of the route that has been fashioned from what were once street medians. And each sbX bus driver has been given virtual command of the traffic lights encountered along the route so that the busses will rarely if ever encounter a red light. But compromises from the original plan were made in which the number of busses that were to cover the route each hour dayling hour – three to six – were reduced and the number of stops along the route were increased to 13, pushing the duration of each excursion from 24 to 41 minutes. That 41 minute duration still compares favorably with the 65 minutes that Omniitrans – the local mass transit provider – previously provided with its busses along the same route. Nevertheless, critics have been vociferous in their objection to the expense of the news system that has only marginally more ridership than the previous bus service. And sbX was widely opposed by many of the businesses along its route running along Hospitality Lane and then up E Street through the southern portion of San Bernardino because of the negative impact they anticipated the project would have on commerce. Part of the negative imposition of the project that was anticipated indeed played out. This imposition consists of the elimination of the turn lanes along Hospitality Lane and E Street, such that motorists are now unable to make left turns and are now obliged to continue further down the street to make a U-turn where that is possible and then retrack back to access businesses, including many of the restaurants in that area. The owners of several once-thriving businesses located along the route, including Ammons Diamond & Coin Gallery, Burger Mania, Pride Envelopes and Barber Shop 215, saw patronage of their businesses diminish. Some closed. Some critics of the sbX system have inveighed against it on the basis of the traffic hazard represented by the buses traveling at speeds in excess of the speed limit for passenger vehicles along the same span of roadway. Omnitrans, the public transit agency serving the San Bernardino Valley which operates the sbX line, and SANBAG, the county transportation agency which acted as the lead agency in obtaining $75 million in federal funding which was applied toward the $192 million project, hailed the line as a major leap forward for beleaguered San Bernardino, which declared municipal bankruptcy in 2012. Omnitrans and SANBAG officials are hopeful that bus ridership along the 15.7 mile route will increase significantly over the next several years, demonstrating the gamble all of the participants took in the effort toward modernizing public transportation option was one that will pay off. With the end of an urban monitoring website’s competition over the selection of what its readers deem to be the country’s most significant vignette of urban improvement fast approaching, sbX supporters are confident they will at last see some recognition – in this case national recognition – that their faith in the fast bus line project was well placed. In its annual competition to have the readers of streetblog.usa weigh in on what they consider to be the “best urban street transformation,” throughout the 50 states, the site’s competition committee selected portion of E Street which was made over with a number of improvements in conjunction with the sbX undertaking as one of five finalists. As of late this week, San Bernardino’s span of E Street is leading the pack of this year’s nominees. Voting in the competition ends on December 28. At press time, E Street in San Bernardino was out in front with 43%, or 616 votes, leading Western Avenue in Cambridge, Massachusetts, which had 27% or 380 votes, Washington Avenue in Minneapolis with 19%, or 267 votes, Broadway in Seattle with 7% or 106 votes and Penn Avenue in Pittsburgh with 4% or 60 votes. While the results of the balloting are by no means scientific, the first place ranking does indicate that the work on E Street carried with it an aesthetic plus. San Bernardino city officials, Omnitrans officers, and San Bernardino Chamber of Commerce members all hailed the streetblog vote as a positive reflection on the city and sbX. The city is looking to create a synergy off the combination of improvements that have been made to the city of late, not the least of which is sbX and the new 11-story county courthouse that opened downtown in May. Others, however, were unconvinced, pointing out that city and transportation officials may have stuffed the ballot box by a campaign that has promoted the sbX project and an effort to have locals cast ballots at the streetblog website in favor of the E Street nomination. (December 23) A legal challenge to the legality and constitutionality of Victorville’s red light camera system – and by extension to all such programs throughout California – is entering a crucial stage after surviving a welter of efforts by the city to have the case dismissed. Last week, Bob Conaway, the attorney in the proposed class action suit which has not yet been certified on behalf of three clients sought to convince the Fourth Appellate District Court in Santa Ana to allow him to move on to the discovery phase of the case to allow him to gather evidence from the system’s operators and Victorville to show the video images captured on the cameras are not always authentic and or reliable. Conaway’s clients originally filed the case in San Bernardino County Superior Court in February 2012, naming the City of Victorville and Australian-based Redflex Traffic Camera Systems, which has a corporate office for the United States in Phoenix, Arizona. Filed in Victorville Superior Court on February 14, 2012 on behalf of lead clients Carole Jaquez, Michael Curran, John Macias and who received red-light tickets issued as a consequence of the Redflex Traffic Systems camera devices mounted in Victorville, the suit propounded that in order for a peace officer to issue a citation for a misdemeanor or infraction, the offense must occur in that officer’s presence. Removing that requirement, as does the arrangement in Victorville, violates the California Penal Code, according to Conaway. Declarations for the red-light camera citations from the Redflex system issued in Victorville are certified under “information and belief,” which the lawsuit maintains is akin to hearsay, not a police officer’s personal knowledge. The officer(s) who issued Jaquez, Curran and Macias their citations did not contemporaneously witness the alleged red light violations, rendering the tickets they received invalid, according to Conaway. In addition, according to the lawsuit, the proofs of service was signed by a Redflex computer operator and was bulk mailed, further rendering the tickets invalid. Utilizing a computer controlled camera to initiate and carry out the citation process, Conaway asserts, deprives defendants of the opportunity to confront their accuser in court, a guarantee granted all citizens under the Bill of Rights. Beyond the Constitutional issue, Conaway contends Australia-based Redflex violated the California Business and Professions Code Sec. 17200 by engaging in unfair business practices that unjustly enriched the company. Moreover, according to Conaway, Redflex should be held accountable under the product liability doctrine because of the flaws in the design and operation of its system. The suit sought $9 million in damages and more in punitive damages for the roughly 5,000 motorists impacted by the system. That case was removed to federal court where the Redflex defendant was able to convince a federal trial court that California’s so-called anti-Slapp statute prevented the action from proceeding. SLAPP is an acronym for strategic lawsuit against public participation. In its anti-SLAPP motion the city claimed Redflex was exercising its first amendment commercial speech rights by taking pictures and selling the images to the city. The federal trial court indicated it would remand the case to State Court for the handling of the remaining claims against the city. After the case was remanded, the action filed on February of 2012 was dismissed without prejudice and refiled in State Court making further allegations under 42 USC 1983 of the federal civil rights act and under a declaratory relief count that the Victorville system, which relies upon strobes to operate, was illegal under the California and federal Manual on Uniform Traffic Control Devices and that the due process rights of the plaintiffs and those similarly situated were violated by the way the citations were being processed. Conaway argued that the prosecutions were handled by unsworn peace officers with no personal knowledge of the offense having been committed, that the citations were served by a private corporation and not the citing entity, the confrontation right was being violated by there being no one actually observing the offense who could be cross examined and the so-called evidence was otherwise inadmissible on hearsay and foundational grounds. The trial court in the second case dismissed the case on the contention that none of the plaintiffs had standing to sue. After the second case was briefed, the California Supreme Court handed down its decision in People v Goldsmith, another automated traffic light citation case in California, which the Court of Appeal asked for further briefing on. In that briefing Conaway’s clients contended that Redflex edits and processes data in a backroom, compiles secret software whose reliability can’t be challenged in infraction trials due to Redflex and the city claiming it to be proprietary information and a trade secret that they do not have to (or want to) disclose. .In the brief, he also raised questions about possible problems related to degrading software, image compression, image warping [which can change location of objects like cars in an intersection] and data corruption. Assumptions are being made about the reliability and accuracy of the system that Redflex and the city have in place, Conaway asserted, but those assumptions have not been tested. He said the discovery he is requesting would allow such tests and verifications of the system’s accuracy to be carried out. Not allowing that verification to be made, he said, would entail a violation of the due process right & equal protection rights of those cited and adjudicated guilty under the red light camera system. He said such reliability verification and standards have been recognized by the courts and other branches of the government in similar and different contexts. One major issue to explore in discovery, Conaway said, is the editing that is done with the video images and whether exculpatory evidence is edited out. “Editing is such a problem and so difficult to detect the United States Postal Inspector commissioned Johns Hopkins University’s Applied Physics Lab to write software to detect editing,” Conaway wrote. Under the way Redflex and Victorville have been operating their camera and citation system, Conaway said, the “burden of proof is reversed” such that guilt is presumed. That approach is compounded by the inability of those cited to examine and bring into question the evidence being used to convict them, Conaway said. The Court of Appeal indicated from the bench that plaintiffs had standing and then stated that they were taking the matter under submission to review presumably the other potential independent grounds to support the dismissal of plaintiffs’ claims. The appellate court is tentatively scheduled to rule on Conaway’s clients’ appeal to open discovery by late March. (December 22) Bob Blough, the former general manager of the San Bernardino County Public Employees Association, is relying upon the doctrine of unclean hands in his response to a lawsuit alleging he misappropriated or embezzled hundreds of thousands of dollars when he was in charge of the union’s operations. In a ten-page response to the association’s suit, Blough denies the misappropriation and embezzlement allegations. He is countersuing, seeking $520,000 in general damages, compensation for the cost of litigation, and punitive damages. In the summer of 2013, Blough abruptly parted ways with the San Bernardino Public Employees Association, which represents and handles collective bargaining for over 11,000 employees working for San Bernardino County and 3,000 others working for 16 of the county’s cities – Barstow, Big Bear, Chino, Chino Hills, Colton, Fontana, Hesperia, Loma Linda, Montclair, Needles, Ontario, Rancho Cucamonga, Redlands, Rialto, San Bernardino, and Upland, as well as three cities in east Los Angeles County, Claremont, Pomona and West Covina, and Banning in Riverside County. Publicly, that development remained shrouded in some degree of mystery for more than 14 months, though there were unconfirmed reports in the immediate aftermath of his departure that Blough was under investigation by the San Bernardino County District Attorney’s Office for some form of undisclosed wrongdoing. On October 17, 2014, a civil action was filed against Blough in San Bernardino County Superior Court on behalf of the San Bernardino Public Employees Association (SBPEA) by attorneys Dennis Hayes and Michelle Hribar of the San Diego-based law firm of Hayes & Cunningham. The association undertook a more extensive investigation of the matter after Blough had departed, according to the lawsuit. In addition, according to the lawsuit, there were other financial irregularities that occurred during Blough’s tenure as general manager. According to the suit, there were other questionable credit card expenses by Blough for storage units, tools, paper, grills and other supplies, which had no supporting documentation available. The district attorney’s office, which has been said to be investigating the financial issues at the association for more than 16 months now and which was given a full copy of Ahern Adcock Devlin extensive forensic audit more than two months ago, has yet to file criminal charges against Blough or Marquez. The lack of action on the part of the district attorney’s office is an indicator that adequate evidence to prove that Blough is in possession of the money he is alleged in the lawsuit to have embezzled has not been turned up. Another indicator is that Blough is representing himself in response to the lawsuit against him and has not retained counsel. According to the lawsuit and San Bernardino Public Employees Association President Ron Dunn, during Blough’s tenure as general manager “unaccounted for money” was “misappropriated by Mr. Blough.” Neither Dunn nor current SBPEA General Manager Deidre Rodriguez nor Hayes nor Hribar would comment on Blough’s present lack of financial resources. In his November 20 response, Blough denied he misappropriated or embezzled funds from the San Bernardino Public Employees Association while he was employed there. Rather, he suggested the association had itself engaged in improper conduct and is now seeking to scapegoat him. The lawsuit, which seeks the return of the missing money and interest on it as well as attorney fees and punitive damages, is meritless, Blough maintains. The association has “unclean hands,” he asserted. In tort law, the doctrine of unclean hands holds that one party in a lawsuit, either a plaintiff or defendant, cannot obtain a judgment against the other party, either a defendant or a plaintiff, if the other has also engaged in wrongful, illegal or unethical behavior. JOSHUA TREE—(December 23) Voters in the Morongo Basin will exercise the ultimate word over whether Tenet Healthcare will move in as the operational and management partner within all of the Hi-Desert Memorial Healthcare District ‘s facilities, which include the Hi-Desert Medical Center and Continuing Care Center. On December 3 the Hi-Desert Memorial Healthcare District Board voted to begin negotiations with regard to entering into an affiliate relationship with Dallas, Texas-based Tenet Healthcare. The board voted 5-0 in favor of Tenet, a $4.2 billion company, which has a working relationship with 81 hospitals nationwide, over 200 outpatient centers and 36,000 physicians. Hi-Desert Medical Center and the Hi-Desert Memorial Healthcare District in general have experienced falling revenues and continuous budget shortfalls over the last several year. In response, the board hired Jon Spees, the senior vice president of the Camden Group to serve as a consultant to map out a strategy for achieving economic stability while continuing to provide adequate and comprehensive care for patients in Twentynine Palms, Joshua Tree, Yucca Valley and Morongo Valley, including the hiring of more medical care specialists. Spees’ recommendation was that the hospital enter into a partnership with a large corporation that possesses the resources to help Hi-Desert Memorial achieve its goals. After soliciting letters of intent from health care provision entities with regard to a potential working relationship, the district received responses from Strategic Global Management and Tenet Healthcare. A previous article in the Sentinel may have left readers with the impression that the deal with Tenet has been conclusively closed. In actuality, the board’s vote cleared the way for negotiations with Tenet to begin in earnest. At the December 8 meeting of the Morongo Basin Municipal Advisory Council at the Joshua Tree Community Center, some basin residents expressed concern about the haste with which the district was moving in affiliating itself with Tenet. There were questions about reliability of the company, the amount of profit it would realize in its operation and questions about its corporate practices, including the provision of incentives, which were interpreted by the U.S. Justice Department to be kickbacks in 2003 when three Tenet employees were criminally charged with delivering illegal inducements to doctors. Ultimately, the government dropped that case. Robert Tyk, the hospital’s chief operating officer, dismissed those questions as ones that were irrelevant to the hospital and district’s precarious financial state and long term solvency. Financial problems are going to continue, Tyk said, and if an affiliation partner is not brought in, the hospital most likely will be forced to close in a few years. The district was $4,765,135 million in the red in the last fiscal year, he said, and does not have the wherewithal on its own to turn its bleak financial circumstance around. Tyk said that Tenet Healthcare has guaranteed the payment of $2 million a year to the district for 30 years as part of a lease and operation arrangement, and the provision of $17 million toward capital improvements, another $10 million toward revamping the hospital’s computer and digital system and $5 million for physician recruitment, all within the first three years of its partnership. The partnership with Tenet will further assist the medical center in garnering an infusion of up to $26.3 million in federal Quality Assurance Funds within two years. Pursuant to the hospital board’s December 3 vote, Tyk said negotiations are now ongoing to put the partnership agreement terms into a draft form. That agreement ultimately will come before voters in the district in May or June as a mail-in ballot. A simple majority vote would actuate the partnership. (December 26) Haggen Food & Pharmacy has moved to acquire a number of Albertsons and Safeway stores in Southern California, including at least three on thee west end of San Bernardino County. In recent years, Albertsons has fallen into a vicious spiral, raising prices and thereby driving away customers, which has led to further raising of prices. Leaner and hungrier competitors such as El Super, Cardenas, Ranch King, WinCo and Food For Less have picked up business in the meantime. Haggen Food & Pharmacy now operates exclusively in the Pacific Northwest. This week, however, it announced it has made arrangements to acquire Albertsons and Safeway stores in Washington, Oregon, Nevada, Arizona and California. Haggen will eventually take over 146 Albertsons and Safeway stores, 83 of them in California. The transition will come in stages. During the initial stage, which will come about in 2015, the Vons in Chino Hills at 4200 Chino Hills Parkway, the Albertsons in Rancho Cucamonga at 8850 Foothill Boulevard and the Albertsons in Upland at 1910 N. Campus Avenue will become Haggen Food & Pharmacies. Safeway currently runs Vons stores. The Haggen chain was founded at the height of the Depression in 1933 by Ben Haggen, Dorothy Haggen and Dorothy’s brother Doug Clark in Bellingham, Washington. Haggen has grown to become Washington’s sixth largest company, operating 18 stores in Washington and Oregon and employing 2,000. Haggen operates 16 pharmacies and will pick up 106 more. Through the Alberstons-Safeway deal, Haggen will increase its market share eight times. The company’s payroll will grow to 10,000 by the completion of the takeover deal. According to Haggen, it is committed to supporting local farms, slaughterhouses and other food and product sources. Haggen’s pricing is roughly in line with that offered by Safeway. .
Haggen is closely associated with another Washington-based company, Starbucks, becoming, in 1989, the first grocery store chain to include in-house Starbucks. Haggen has engaged in some innovative marketing schemes in the past, such as operating 24 hours per day beginning in 1984. It abandoned that angle at most locations in 2010. Haggen stores feature a bakery, deli and butcher. The company had grown to 31 stores with revenue of $884 million in 2008, but was blindsided by the economic downturn, seeing its revenue dip by $144 million the next year. Weakened by trying to keep its entire operation intact, the Haggen family in 2011 lost majority ownership of their stores to a private investment firm, Comvest Partners. Convest then embarked on a three-year conflation plan, closing thirteen of the company’s poorest performing stores. were the pioneering organizations of civilian female pilots first organized in September 1942 and, employed to fly military aircraft under the direction of the United States Army Air Forces during World War II. The WFTD and WAFS were merged on August 5, 1943, to create the paramilitary WASP organization. Their contribution to the war effort consisted of ferrying military aircraft both from the factories where they were produced to military bases and in some cases from military bases to other military bases, thus freeing up Army Air Corps pilots for combat duty. WASPs did not receive combat training and did not fly in combat roles. Records do not reflect that they ever served overseas, though one WASP who lived in Southern California in the 1980s claimed she had ferried planes to Greenland. Between September 1942 and December 1944, the WASPs delivered 12,650 aircraft of 78 different types. Some 25,000 women applied to join the WASP, but only 1,830 were accepted and took the oath. Only 1,074 of them passed the training and joined, receiving commercial pilot certification in the process. They were trained to fly using Army Air corps standards by the U.S. Army Air Forces in a four-month military flight training course at Avenger Field in Sweetwater, Texas. Thirty-eight WASPs died in service to their country. One of those was Marie Michell. 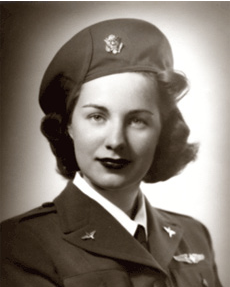 Born on May 23, 1924, in Detroit, Michigan, Marie Michell joined the WASP in late 1943 when she was 19. She already had her private pilots license when she reported to Avenger Field. She graduated on March 13, 1944 in Class 44-W-2. .
She was initially assigned to the Fifth Ferrying Group at Love Field in Dallas, Texas. The Fifth Ferrying Group was part of the Air Transport Command. While with the Fifth, Michell flew all order of military planes from their factories to various bases around the Continental United States. She was later transferred to Victorville Army Air Field , later renamed George Air Force Base in what is today Victorville. Regulations prohibited WASPs from being married. Nevertheless, secretly in August or September 1944, Marie Michel married a U.S. Army Air Corps flight surgeon, Major Hampton C. Robinson. On October 2, 1944, Michell Robinson reported to replace another WASP pilot on what was in official log books described as a “day transition” training mission. In the B-25D Mitchell bomber with her were First Lieutenant George Danilo Rosado from San Diego, a twenty-seven –year Army Air Corps pilot with two sons, and Staff Sergeant Gordon L. Walker, also married with a two-year-old son. Rosado was the pilot; Michell was the copilot; Walker was acting as the crew chief, whose task would be to lower the landing gear in the case of a hydraulic failure. The plane took to the air in clear weather from Victorville Army Air Force Station at 1:15 p.m. local time with Rosado, who had 1,521.5 flight hours to his credit, at the controls. Two other aircraft, Bell-P-39 were in the air during that approximate time. One of the P-39 pilots, Second Lieutenant Lawrence A. Beishel, reported that he saw the B-25D stall and then enter a spin from which there was insufficient altitude to recover. The centrifugal force from the spin would have prevented any of the crew from ejecting. Lieutenant Beishel reported he could see no parachutes emerge from the plane, which crashed into the desert floor roughly 25 miles west of Victorville Army Air Force Station at 1:30 p.m.., and burst into flames. The army board looking into the crash made a finding that the pilot, assumed at that point to have been Rosado, had permitted the B-25D, serial number #41-30114 to stall and enter a spin from which there was insufficient altitude to recover. Who was actually flying the craft at the time of the fatal plunge could not be conclusively determined. The North American Aviation Corporation flight manual for the B-25 gravely warns pilots that the aircraft should not be intentionally entered into a spin under any circumstance. Unlike Army Air Corps pilots, WASPs were considered civil service employees and did not receive military benefits. Because they were not considered military under the existing guidelines, a fallen WASP was sent home at family expense without traditional military honors or note of heroism. The army would not allow the U.S. flag to be placed on the coffin of the fallen WASP. Major Robinson was granted leave to accompany his wife’s body home to Flint, Michigan, where her remains were interred.